My SIL sent me this quilt ti bind for her. She and my brother found it in the attic of the house she lived in for more years than I can imagine. Anyway, I laid it out on our queen size bed and discovered how big it is. I called her and asked if she would like wide borders on it so that she could use on her bed. She said yes. It is machine pieced and hand quilted by my mother. What would you suggest for borders, how wide and possibly more than one border? Then I can bind as originally planned. If it were mine, I would use reproduction prints and keep the border scrappy. You could do a narrow inner border of a solid or nearly solid in whatever color you like best in the quilt and finish it off with a wider scrappy border. What a fun quilt! It looks like she used up her orphan blocks and scraps. There is quite a bit of pink in the quilt and maybe a pink/rose border would work. Blue would look good also. Ditto! I think any of the reproduction prints would work - looks like a very nice quilt. Looks similar to my sister's SO's mother's quilts. But her's were no specific order. No real pattern and he said they were at least 50 years old. he has a couple displayed on the back of his sofas but has the other 5 in white garbage bags. I told him to at least put them in KIng size pillow cases so they could get some air. I would border this with a red or a green. Something darker to make the quit pop. My suggestion would be to use reproduction fabrics and make a piano key border. You can make the strips any length you want and 6" sounds like it would be a nice compliment to what is already there. Please post a picture of what you decide.... you know we like to look!! I don't have any suggestions just wanted to say that this is truly a treasure and I hope she has it for many more years. I would do a simple plain border. I'm afraid a border using current, reproduction fabrics might detract from the wonderfulness of the original piece. I think I would do 2 borders, the first a solid, and then a second wider border of a 30s print. You have such a choice of colors I would have to lay out border fabrics to pick something. Please do show it when you are done, it is a beauty and deserves to be finished. I would use a muslin (not sure of the cornerstone fabric) used in the cornerstones and put a narrow strip of muslin, then a scrappy wider border of repro fabric then another muslin strip. What a treasure. What a treasure you found! I agree if you can find thirties print for the border. If not I might go with a cream print. I think a soft blue narrow border to stop the eye and then a 1930's print or scrappy piano key border would look nice! It looks like each block is a different pattern. It has so many different fabrics in it that you could use almost anything. If you add one 6 inch border you will have to quilt a pattern in it because it is over 5 inches and too wide for no stitching. What a lovely keepsake! Just MHO, but I would not put a border on it. Tell your SIL to get a dust ruffle, and leave the quilt as is. 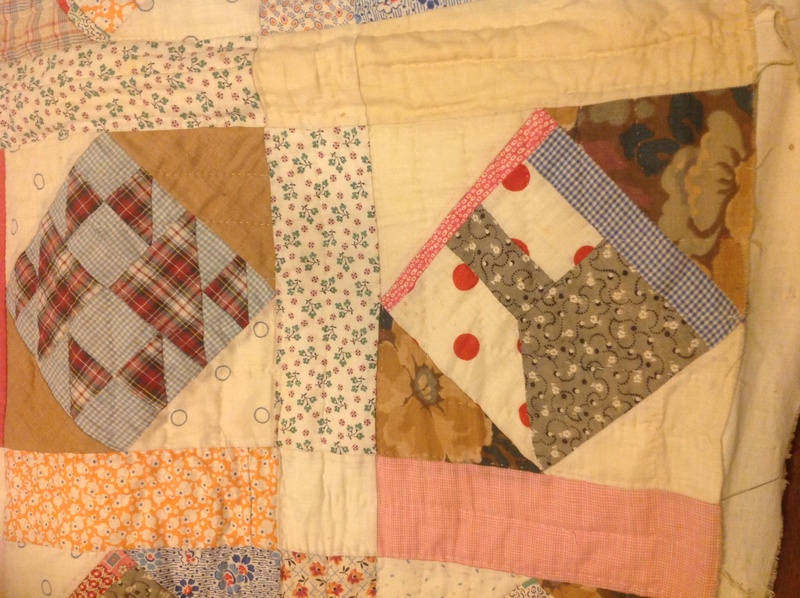 In the 30's, they did not put borders on quilts very often. It is gorgeous as is, I would bind it with an unbleached muslin binding. Good luck. 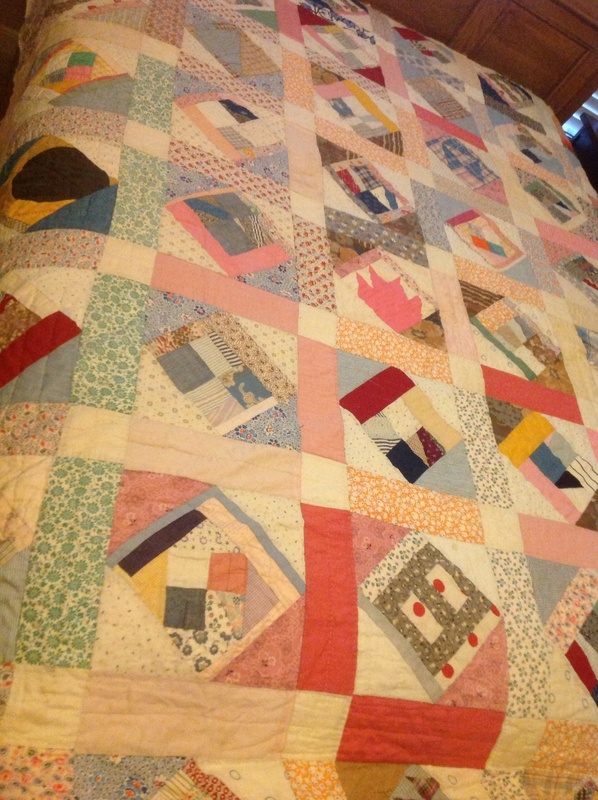 I have one that my great grandmother hand pieced and my grandmother set together my machine, that I am going to hand quilt, that is original 30's fabrics, and I am not going to put any borders on it. Just MHO. Have fun with it and enjoy. This is what I was going to suggest as well. I'd make the border the same colour as the cornerstone fabric. and make curved vines and flowers on it.